For the last 8 weeks, coloring has been my new morning quiet time ritual. Surprisingly, this powerful obsession has taken over my life. I can’t seem to stop once I start. Everything else falls away, time stands still and if I have to stop, I can’t wait to return to this new addiction. My new place of hyper-focused energy and being right in the moment from the first sweep of color on the page has brought an avenue of instant peace and serenity to my life. All else fades away. Amazingly, I have just discovered Adult Coloring Books that are now a huge craze in the United States and it is not going away! Looking deeper into the phenomenon of Amazon’s offering of Adult Coloring Books, I wondered what was causing this business to soar? Could it be the feeling of one-pointed centeredness that caused all other distractions to quiet down? Is it possible that the ability to actually focus on one thing without the tendency to multitask is so rare these days? Might it be the experience of completely finishing one task before starting another one? Personally, I know it is the sweet return to times of simpler, childhood memories. Returning to coloring as an adult has also helped bring the day to a quiet close, washing away negative emotions, allowing me to accept what is as well as what the next day might bring. Coloring has become my low-stress, low-stakes way to unlock my creative potential without self-judgment of my abilities. 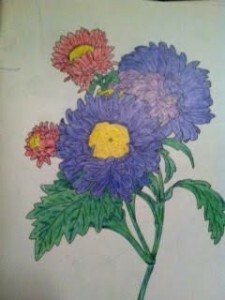 I just color, finding the freedom to remain simply inside myself. In fact, I love that someone else designed the picture and all I need to do is add color. No pressure to draw or design, all I need to do is simply color. 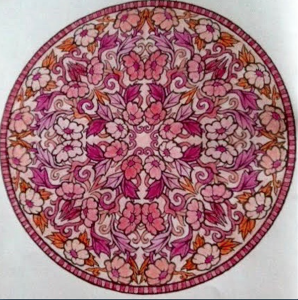 If you are looking for a way to find calm in chaos, Adult Coloring Books might be just the answer for you as it has been for me (and many of my doubting friends)! Hi Janis, this sounds like a wonderful new/old past time! Love the idea and am currently looking for a coloring book. I love the first picture; can you tell me what book that is from?